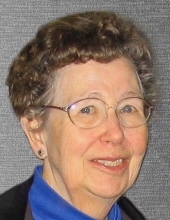 Peoria-Patricia Ann Barth (Hickey), age 90, of Peoria passed away on Tuesday, January 29, 2019. She was born on October 2, 1928, in Terre Haute, Indiana. A graduate of the Academy of our Lady (now Notre Dame) in Peoria, Pat went on to earn a journalism degree at the University of Detroit. After college, she worked as the women’s editor for the Peoria Morning Star. She was married to William J. Barth (deceased) on October 18, 1952. Pat and Bill were both active members of St. Thomas Catholic Church. Pat founded the St. Thomas School library, was on the first school board, and was president of the Altar and Rosary Society. Other volunteer activities included scout leader, Great Books leader, and St. Thomas garage sale volunteer. Her love of nature was evident in her participation in the Peoria Herb Guild and her design and maintenance of the herb garden at Sommer Park. Talents she shared with her children and grandchildren include gardening, baking, and a love of literature. Pat is survived by her five children: Stephen (Denise) Barth of Whitesboro, NY; Teresa (Jim) Ackermann of Fairfax, VA; Bernard (Lenette) Barth of Dunlap, IL; Joan Barth (Dave Boles) of Tuscaloosa, AL; and Catherine Barth of Anchorage, AK. She has eleven grandchildren: Colin Barth, Laura Barth, Rob Ackermann, Colleen Ackermann, Mike Ackermann, Chasydi (Barth) Ischer, Leah Barth, Jordan Barth, Lyssa Barth, Walter Boles and Madeline Boles. A Funeral Mass will be at 10 AM on Saturday, February 2, 2019 at St. Thomas Catholic Church, with a half hour prior visitation. Further visitation will be the night before, Friday, February 1, 2019 from 5 – 7 PM also at the Church. Msgr. Jason Gray will officiate and burial will follow at Swan Lake Memory Gardens. In lieu of flowers, memorials in Pat’s name may be made to St. Thomas Food Pantry or OSF Richard L. Owens Hospice Home. To send flowers or a remembrance gift to the family of Patricia Ann Barth, please visit our Tribute Store. "Email Address" would like to share the life celebration of Patricia Ann Barth. Click on the "link" to go to share a favorite memory or leave a condolence message for the family.